In previous blogs we have looked at creating a character/s, creating material, creating magical routines and now lets look at creating a show! I am going to do this in at least two parts. This week is a little bit about my own experience in putting a show together and then in my next blog some advice and tips! Back in 1990, I was inspired by a street performers’ show and it changed the course of my life. 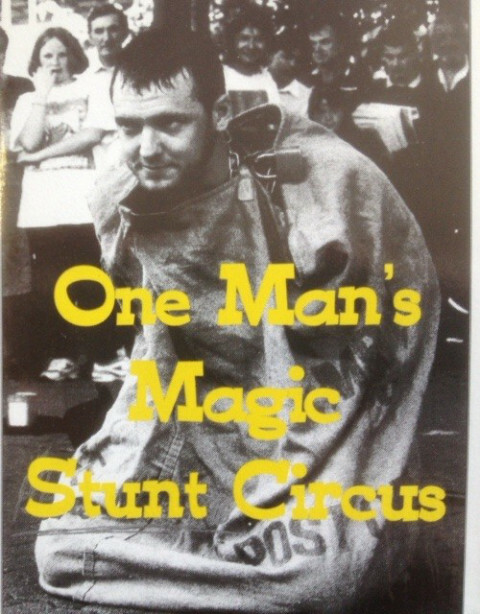 I now knew what I wanted to do for the foreseeable future – I wanted to become a street entertainer. I had a lot of experience of working with the public and the street. Being a street trader from the age of fourteen gave me a good knowledge of the streets. Becoming a pitch man educated me in sales and attracting an audience. Worldwide travel taught me how to think outside the box and that led me to set up a walking tour guide of the Old City Of Jerusalem. In hindsight becoming a tour guide gave me a basic introduction into showmanship! This was no small feat of achievement for an eighteen-year-old lad who knew nothing about Israel when he arrived two years earlier in 1985. I scripted and did a four and a half hour walking tour. We would walk the Armenia quarters then into the Jewish quarters then visiting the Muslim sites, we would finish in the Christian quarter. This gave me a broader understanding of theology and monotheism beliefs and from my teens I explored Witchcraft. For a while, after I returned to the UK I gave some public addresses on the subjects. Alongside this, the only physical skill I had developed as a hobby was that of a juggler. I knew I had a lot to learn if I was to make it as a street performer! So here I was once again about to walk through the door of change. I felt this was going to change the very direction of my life, I was right. One problem I had was that I had no idea where to begin. Back then there was no internet or street performing schools that I knew of (years later this led to my setting up the world’s first School of Busking – but more about that in a later post). This was street and I was a street guy wanting to learn a new street craft – busking! My first step was to study street performers, so armed with a notepad and pen and pocket full of money I went to Convent Garden and for weeks I watched these street guys. Then I went off did some fly pitching and I came back with more notes. I watched circus acts, clowns, magicians, and acrobats. I could not get enough of these guys. I watched some shows over and over again. In-between shows I was either street trading or visiting a magic shop that I hunted down in Charring Cross – Davenports. By the time I returned to Cardiff I had what I thought to be the making of a street show – aTT and silk, fire clubs, Dippy Duck and a set of cups. I worked on my show and then took it out. It was a disaster! I managed to build a crowd but that crowd never became my audience as I just died in front of them. They just pointed the finger at me and laughed! Giving up did not even cross my mind – this was not an option. To me, Street performing was the ticket to the world and a more fulfilling life so I pressed on. I soon learned that the cups and balls were too much for me to master at this stage. I returned to London and of course, I visited Covent Garden but went to another Magic shop. Kaymar Magic, I was greeted with a cup of coffee, Paul and his wife was most helpful and suggested escapes – why not do a mailbag escape? Back then there was no ready-made escape sack (again – not that I knew of) so I just bought the bar and two padlocks and off I went with the choice of either making my own sack or source a Royal Mail bag and that is what I did. In addition, I bought a set of handcuffs and fifteen yards of chain or so. Now with regained confidence, I returned to Cardiff and worked on my show! I found straight away the chain helped to attract the crowd. I used the TT to create mystery, fire clubs to build the crowds then Dippy duck got me great laughs and then I was handcuffed, wrapped up in chain and climbed into a postal service bag – and I could see the crowd was now my audience and it was growing. The Sack was pulled over my head and bar threaded through the eyes of the sack bringing the sack shut over my head. Finally, two padlocks were locked at either end of the bar. I discovered there was just enough room between the bar and the sack for me to pop my head out, so I did and I then delivered my hat lines – these were quite rough as you can imagine. I then pulled my head back into the sack and made my escape. Success!! People came forward and tipped my hat! OK, it was not the greatest hat in the world but I was delighted and from that day on I became a full-time street performer! Next blog “Putting a Show together, part two” I will be giving suggestions and tips on how to put a show together.